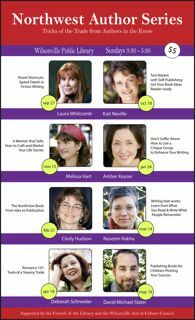 The Northwest Author Series is a literary speaker series sponsored by The Wilsonville Public Library, The Wilsonville Friends of the Library and the Wilsonville Arts & Culture Council. The series is created, publicized and hosted by Wilsonville author Christina Katz. We are now scheduling our next season. Our presenters last season included Marc Acito, Heather Sharfeddin, Cynthia Whitcomb, Shelly Lipkin, Sage Cohen, Susan Fletcher and Elizabeth Rusch. The series takes place the third Sunday of each month during the school year and features writing professionals who have a desire to share what they have learned with our growing suburban literary community. The theme for the upcoming season is How To Write Literary Forms. Presenters are encouraged to engage the audience in exercises or brainstorming throughout their 90-minute presentations. In your pitch, please convey how others might learn writing and publishing strategies you have mastered. Final selections will be made by July 18, 2008 for the 08-09 season. We will contact those selected at that time to set a presentation date. Presenter pitches should follow our sample format.